Federal Guidelines 2 CFR Part 200 §200.430 require institutions of higher education to follow guidelines pertaining to documentation of personnel expenses including proposing, charging, reporting, and certifying effort for sponsored awards. NMSU supports this through Banner EEC, an online certification process which works best when utilizing Internet Explorer.Non-exempt and PSL employees (utilize Web time System) whom charge effort on sponsored awards complete timesheets which the federal government states is acceptable documentation for reporting effort and, therefore, are not involved in the Effort Certification process. Effort reports are required to be reviewed and certified by individuals with direct knowledge of the work performed. Failure to meet federal requirements could result in loss of funding, audit findings, settlements, and damage to our institution’s reputation. Review effort percentages for accuracy and complete “Review Action” on EEC report. Email Notifications – received weekly until Review Action has been completed. NOTE: If the Review Action has not been completed, delinquent notices will follow every business day after the Review Period deadline until the Review process has been completed. 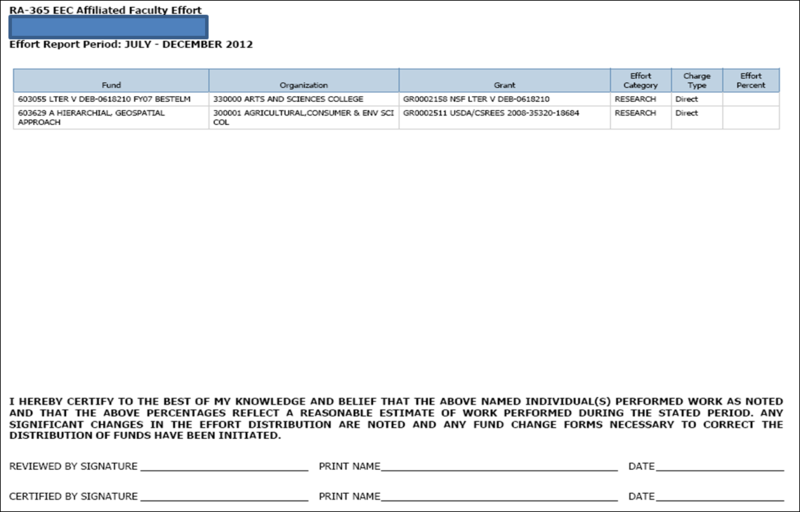 Reviewer Roles are established in FRAGRNT by the SPA Systems team as indicated on New Fund Number Request Form (NFNR). Assigning Personnel Indicator 004 EEC Administrator is required; assigning Indicator 003 EEC Pre Reviewer is optional. Review effort percentages for accuracy and complete “Certify Action” on EEC report. Email Notifications – received weekly until Certify Action has been completed. NOTE: If the Certify Action has not been completed, delinquent notices will follow every business day after the Certification Period deadline until the Certification process has been completed. The employee should certify their own effort unless SPA determines it is appropriate for the alternate certifier to perform the action. The following business rules are followed in the Electronic Effort Certification Process. Any work performed for the Institution, regardless of where and when, is considered part of the person’s effort and must be included. An individual cannot claim they performed work on ‘their own time”. There are no nights and weekends. The example below provides multiple activities based on a weekly average of 50 hours. Regardless of employment status (e.g. FTE, PTE, etc.) the total hours worked will equal 100% of the effort reported. A memo (like the one seen here) will be sent out to Research Centers after an individual has been identified as being paid 100% on sponsored funding during a specific effort reporting period. SPA will request for departments/colleges to review the employee’s labor distribution to determine if the 100% allocation is correct. If so, a justification option must be chosen (or written in) and the documentation must be signed by someone with direct knowledge of the work that was performed. 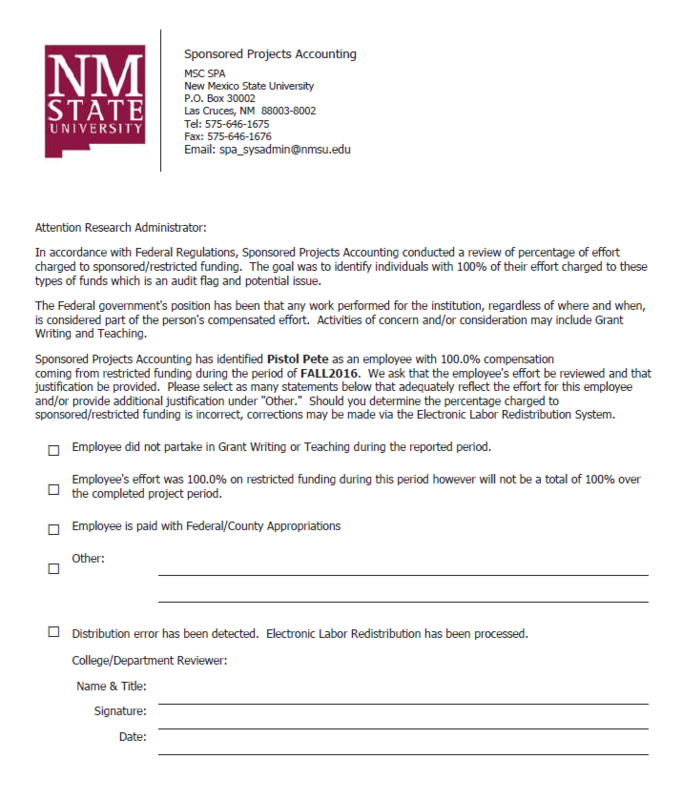 Affiliated Faculty effort is not captured outside of proposals and award documents because the EEC reporting system is based on compensation through the NMSU payroll system. To cover all aspects of federal regulations, SPA generates manual effort reports for Affiliated Faculty which allow the individual to provide a percentage of effort put forth per each associated funding source. *EEC email notifications contain hyperlinks to quick reference guides. For questions, contact Laurie Leyva at 6-6379 or SPA_SYSADMIN@nmsu.edu. Internet Explorer is the preferred browser; others may cause error messages. Frequently verify expenses (at least monthly) for both sponsored and non-sponsored projects to identify any potential errors requiring Electronic Labor Redistributions (ELRs). Percentage of effort is determined by taking the 6 months of payroll and averaging payroll by each fund. The Review Action must be completed before the Certification Action can be taken. The Review button will not be available before the Review Period. The Certify button will not be available before the Certification Period. Corrections to effort can only be made via the ELR process. If ELRs change effort percentages more than 5%, the EEC report will require a new review and certification. Once effort has been certified, the payroll records will be locked and ELRs cannot be processed unless approved by SPA. Individuals with an active role in the EEC process should not share logins or delegate the assigned certification role on their behalf as EEC reports are subject to audit examination and require that only individuals with direct knowledge certify an effort report. Alternate Certifiers only take action when the Certifier cannot certify on their own behalf and must have direct knowledge of the work performed. EEC reports that have been re-extracted or that have had late ELRs processed must be reviewed and certified again. No action can be taken when an EEC report has ELRs pending. The “Request Changes” button and the “Add New Funding” buttons are not used by NMSU. Any changes to the members on the EEC Routing queue after the Certification Period has begun will take effect during the next Effort Reporting Period. See below for process to revise routing queue members. For immediate changes to the routing queue, a request to re-extract EEC reports should be made to SPA_SYSADMIN@nmsu.edu. Reviewers are changed by reassigning the EEC Administrator or the EEC Reviewer on the NFNR (both are Reviewers). Reassignments should be submitted to SPA_SYSADMIN@nmsu.edu. Alternate Certifiers are changed by reassigning the Financial Manager listed on the fund that appears on the EEC. Restricted Financial Manager changes should be submitted to OGC, Unrestricted Financial Manager changes should be submitted to AFR and Gift Financial Manager changes should be submitted to the Foundation.